This image covers some high-standing topography just outside the rim of an impact crater about 30 kilometers (19 miles) in diameter near a Martian hill named Zephyria Tholus. The High Resolution Imaging Science Experiment (HiRISE) camera on NASA's Mars Reconnaissance Orbiter recorded this image on March 9, 2010. The target for this HiRISE observation was a suggestion submitted through the camera team's HiWish public-suggestion program. For more information about how to submit target suggestions, see http://uahirise.org/hiwish/. What formed this hill? Could it be a volcano? That was hypothesized to be the case in a paper published in 2001, and this suggestion was entered to test that idea, perhaps from seeing internal layering exposed by the crater. This is an example of what we regard as an excellent science justification for a target suggestion: following up on a testable hypothesis with specific observational goals. It was entered by eminent blogospherian Emily Lakdawalla of the Planetary Society. If you're thinking we chose to acquire this image early because we want her to blog nice things about HiRISE and HiWISH, you're right! But it's also a good suggestion. 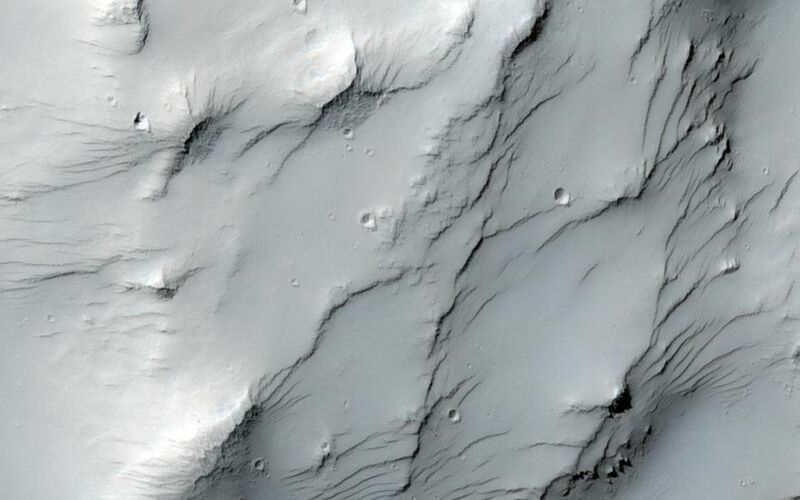 So what does the HiRISE image show us? Mostly it shows a dust mantle, hiding the bedrock it was intended to study. Bummer! The dustiness is especially apparent from the uniformity of the color data. Much of Mars is covered by dust, so we often favor the relatively dust-free patches for HiRISE imaging. You can usually tell whether a surface is dusty by looking at dust index maps and the nighttime infrared mosaic available at http://www.mars.asu.edu/data/ from the Thermal Emission Imaging System (THEMIS) camera on NASA's Mars Odyssey orbiter. We hope to get the nighttime infrared map entered as a layer of HiWISH to help image suggesters. The night-infrared bright (warm) stuff is rocky or sandy, and dark (cool) stuff is probably dusty. Dust cools off rapidly at night while rocks store and slowly release heat. 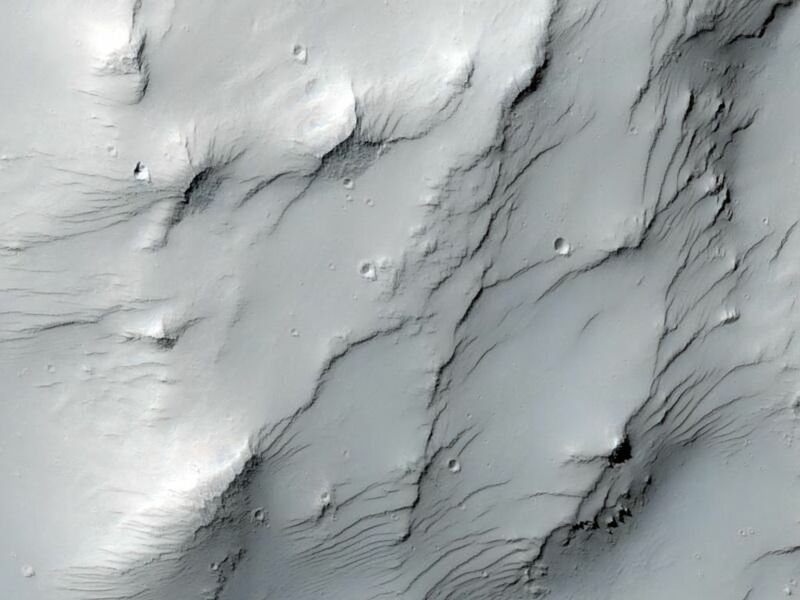 If the dust is thin, HiRISE images can still show the underlying meter-scale morphology. Maybe someone will want to study the dust-related processes on Mars, which are actually not well understood. Also, dusty surfaces are where we can find new impact craters that disturb the dust and make easy-to-see dark spots. We'll see if Emily finds something interesting in this image. This image covers a swath of ground about 1 kilometer (about two-thirds of a mile) wide. It is a portion of HiRISE observation ESP_016954_1590, which is centered at 20.65 degrees south latitude, 173.19 degrees east longitude. The season on Mars is southern-hemisphere autumn. Other image products from this observation are available at http://hirise.lpl.arizona.edu/ESP_016954_1590. Color images from HiRISE combine information from detectors with three different color filters: red, infrared, and blue-green. Thus they include information from part of the spectrum human eyes cannot see and are not true color as the eye would see. The resulting false color helps to show differences among surface materials. The University of Arizona, Tucson, operates the HiRISE camera, which was built by Ball Aerospace & Technologies Corp., Boulder, Colo. NASA's Jet Propulsion Laboratory, a division of the California Institute of Technology, Pasadena, manages the Mars Reconnaissance Orbiter for the NASA Science Mission Directorate, Washington. Lockheed Martin Space Systems, Denver, built the spacecraft.